The visualization of audio is nothing new. There are simple ways to “see” audio such as recording something into a DAW and seeing the waveform, or going a little more advanced and diving into the world of cymatics. Either way, it is very interesting to allow another one of your senses to experience what (at one point) was specifically for just one. Happily married people will often tell you that one of the best moments in their lives is getting married. Wedding videos, rings, photos, and the like are all things one has to remember the big day by. 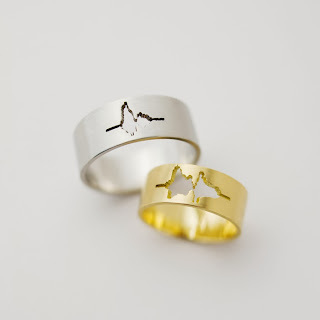 Japanese artist Sakurako Shimizu takes things one step further: she engraves the waveforms of the “I do” into rings. To an audio geek, this is pretty freaking cool. Now along with your wedding video and photos, you can now forever “see” your “I dos”. Shimizu has been doing more with waveform jewelry then just this. She has also created waveform brooches, necklaces, bracelets, and earrings. Her choice for the audio of the necklaces and brooches are human emotions. The necklaces are giggles, and the brooches are wows, yawns, and sneezes. This gives a whole new meaning to the term “showing your emotions”. The brooches mentioned above have even been recently added to the Museum of Art and Design in New York City! Shimizu cuts these waveforms into precious metals. I’m not much of a jewelry fan, but I am a fan of audio. Shimizu creates many other types of jewelry such as a 1981 Atari ring, but the audio ones hold a special place in my audio geek heart. Shimizu states that any recorded audio can be engraved onto her rings, and that orders are being taken. There is a list of prices on Shimizu’s blog. Would this be something you would get for your wife or husband? If he or she shares (or at least respects) your love for audio, it may be a nice addition to your wedding video for a timeless way to always remember those precious “I dos”.